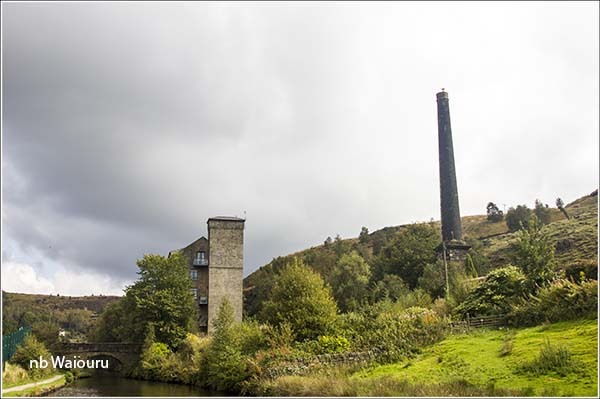 It was time leave Hebden Bridge and continue to climb towards the summit. The ascent starts to become steeper which means the locks are closer together. 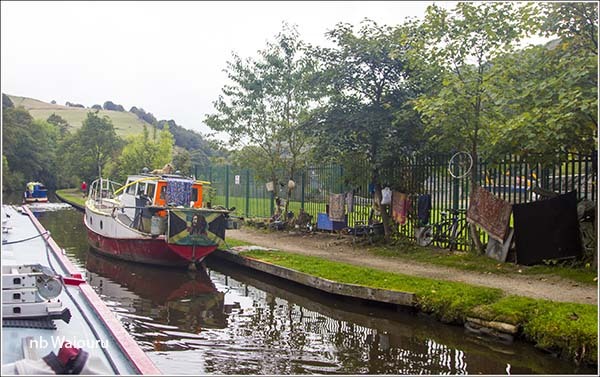 Hebden Bridge looks a little “alternative lifestyle” which is reflected in the long term moored boats. We started to get into a routine leapfrogging our way up through the locks. Some of the gates and paddles were in good condition and others required two people to move them. As we gained altitude the terrain started to open out. No longer did we feel like we were trapped in a narrow valley. There are still signs of former mills from a bygone era. 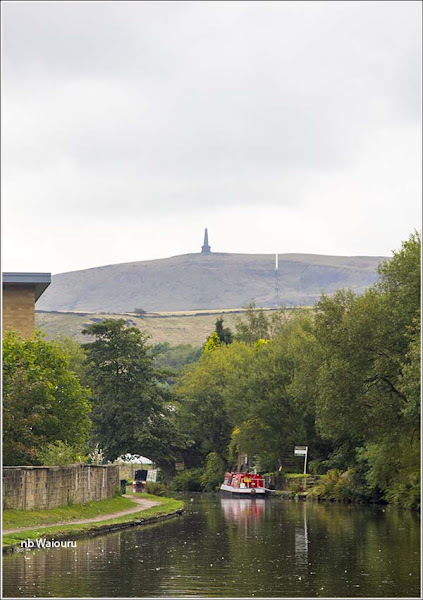 As we approached Todmorden it was possible to look back and see Stoodley Pike on the skyline. 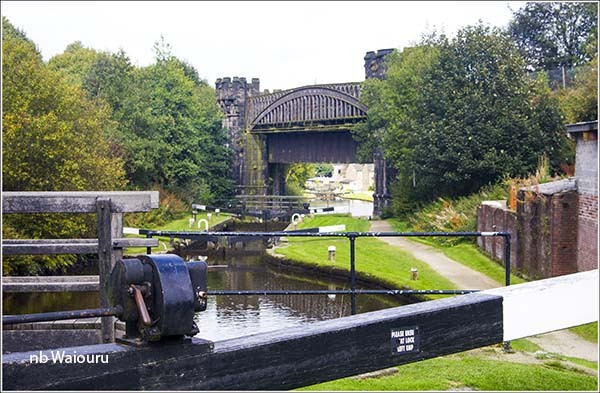 Nine locks later we reached Todmorden. 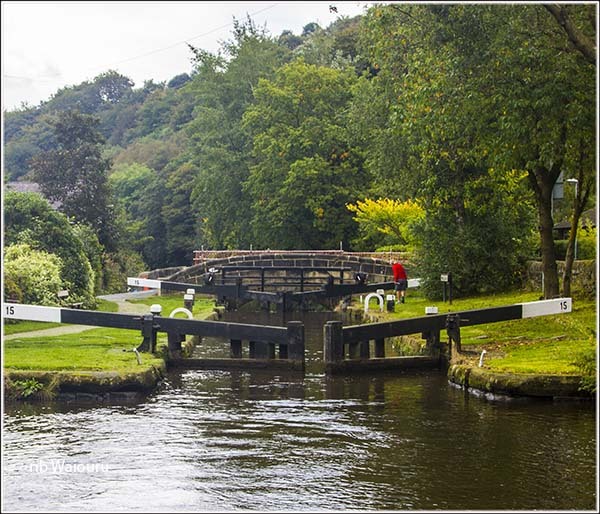 Beyond Shop Lock is a short pound on a bend where the CRT services can be found. As we approached the CRT services mooring I could see a hire boat on them but they didn’t have their hose out. I asked “Are you taking water?” They replied “Our hose isn’t long enough!” Their problem was two unattended boats had been left on the end of the services mooring which meant their bow (and filler point) was too far away from the tap. I asked if we could breast up against them as I was sure our hose had sufficient length to reach the tap. They readily agreed and we filled both boats. 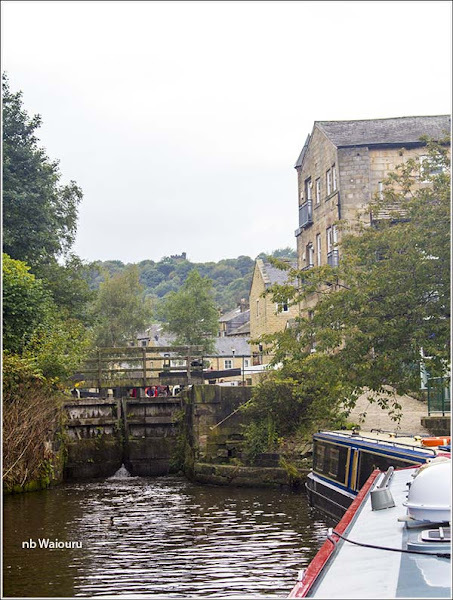 The hire crew then decided to stay on the water point and have a look around Todmorden, whilst we wanted to press on. 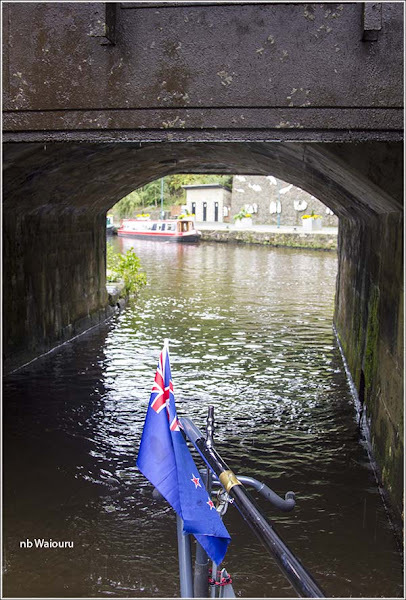 Rochdale road has obviously been widened since the canal was built because the approach to the next lock (Library Lock) goes under the original stone arch bridge and then an adjacent concrete extension. 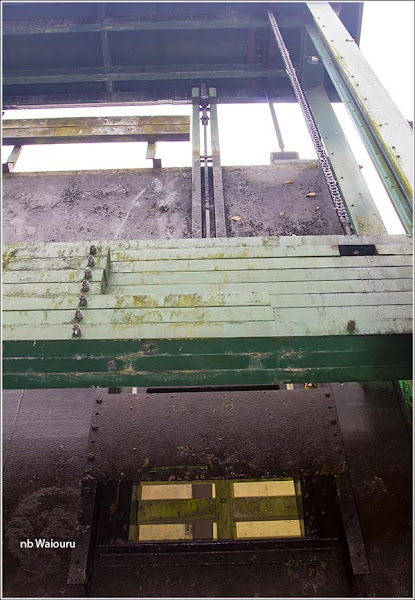 The extension restricted the operation of the original lower lock gates and as a consequence they have been replaced by a mechanical/electric guillotine gate. The raising and lowering of the gate is electric, but the paddles are manual. It’s not a particularly pleasant feeling cruising under the large guillotine gate and counterweight. Looking back through the gate it’s possible to see the CRT services mooring and the Shire Cruisers Hire Boat. The area around the lock was occupied by loud but friendly locals and their dogs steadily drinking their way through numerous cans of cider. 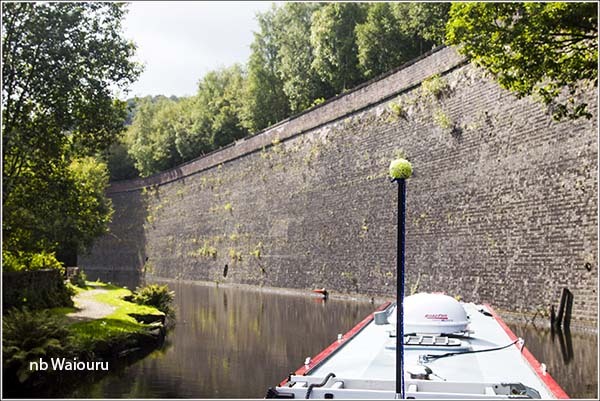 On exiting the lock you are confronted with what I have named “The Great Wall of Todmorden”. It’s obviously not the correct name but I’m just too lazy to do my research and identify its correct name. One of the locals told Jan 6 million bricks were used in its construction. It’s quite a retaining wall. Must have been an expensive project for the original canal builders, but probably cheaper than constructing a curved tunnel. We carried on climbing out of the valley steadily transiting locks. 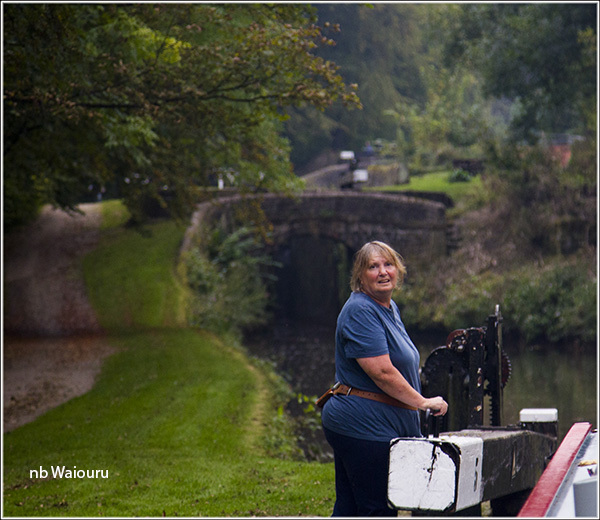 After 20 locks we were all rather “pooped” and decided to stop for the night just above Nip Square Lock. Jan had purchased a steak pie from a market stall in Hebden Bridge which we had for dinner. Both of us were impressed. It was full of solid chunks of tasty steak. No grizzle, gravy or mince! The head should hit the pillow hard tonight. You are almost correct in the name of the wall. It is known as "The Great Wall of Tod". Fluke! Or great minds think alike! The Great Wall of Tod was built for the railway, the last of the transport systems to arrive, which had to squeeze into the available space in the narrow valley after the river, road and canal had selected their routes first. No wonder train travel is so expensive. They must still be paying back the loan!